I used to be the person everyone loved to hate. I could eat. One of my favorite things was noodles with butter and my favorite time to eat it was midnight. I never gave calories a second thought. My best friend, God Bless her, had to watch every calorie. I watched her for years eat nothing but salad and spearmint lifesavers. She was tall with thick, gorgeous hair and high cheekbones and I was short with chipmunk cheeks. We were two sides of the same coin. She was Candice Bergen and I was Goldie Hawn. WHY SHE DIDN'T SHOOT ME YEARS AGO IS BEYOND ME. I'VE NEVER MET A CHOCOLATE CAKE OR CHEESECAKE THAT I DIDN'T LIKE. I never realized how hard it is to lose weight. Now I can't even look at food without it ending up on my thighs. Jude can tell you all kinds of tips for dieting. Me? Don't even think about asking me for diet advice. I think that chocolate cake or cheesecake lose calories if you break it up into pieces. 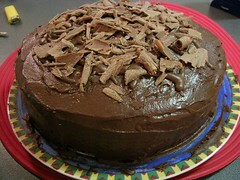 So in honor of all of us who sometimes need a little chocoholic heaven, here is the "I Don't Know Cake." NEVER, EVER............. ASK ME FOR DIETING ADVICE. The I Don't Know Cake originated from one of my mother's recipes. She would write things down without measurements so I was left to figure out what went into what and how much. This was one of those recipes. In a mixing bowl blend the flour and sugar. In a saucepan melt the butter and then add in the cocoa and diet coke. Mix well and bring to boil. Pour into the flour mixture and blend well. Add the milk, eggs, soda and vanilla. Then carefully add in the miniature marshmallows. Now she underlined carefully add the marshmallows. We wouldn't want anything to hurt those babies would we? Pour into a 9x13 baking dish and bake at 350 for 40-45 minutes. Set aside to cool. Melt the butter then add the cocoa and diet coke. Pour into the powdered sugar and mix well. Pour this over the still warm cake. 4 or 5 pieces of this make a nice snack.